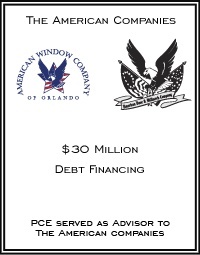 In 2002, Mr. Barton and Mr. Dello Russo created American Window to bring the same caliber of service to the window distribution and installation business. This Company provides sales, installation and service of windows, sliding glass doors and mitred glass to residential and commercial builders. The Companies operate out of a 95,000 square foot office and manufacturing complex in Sanford, a 65,000 square foot facility in Tampa and a 50,000 square foot facility in Jacksonville.